If you are an unconventional person and want an offbeat wedding ceremony, do not worry as we have got you covered. We will help you to plan your wedding ceremony in a non-traditional way, along with 10 amazing ideas to make your big day extra special and creative. Read on to get inspired by these ideas and thus organize a unique nontraditional wedding ceremony. In a traditional wedding ceremony, the guests should be seated on two different sides, one of the bride and the other of the groom. However, you can give this traditional ritual your own twist. No two ceremonies are similar, so why the seating should be similar. You can arrange the seating in a circular or spiral shape around the altar. A beach wedding can have a unique seating of pallet ottomans. Instead of fresh flowers, carry a bouquet made of silk or clothes, as it would not die, fade, or wilt. It will last forever and can even be customized to your particular color palate. Let go of the traditional unity candle lighting ritual and opt for a knot-tying ceremony by joining two ropes with the help of a fisherman’s knot. In this ceremony, the couple will tie the knot together and make it strong and tight. The knot represents the strong bond of the couple. 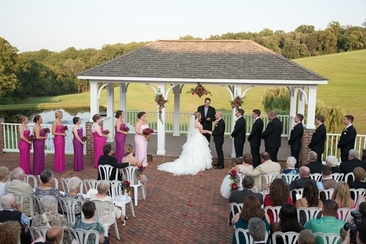 It is not necessary that your wedding venue should be a religious institution. You can pick a venue which is meaningful to both of you. It can be the place of your first date, no matter how unexpected it is. It can be a park, the backyard of your house, a hip city attic, an old theater, etc. 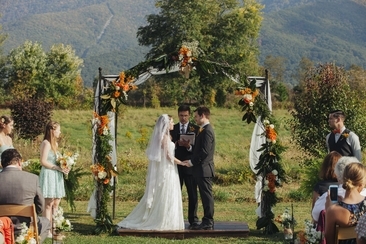 Ensure that your officiant is comfortable with the non religious space that you choose for your nontraditional wedding ceremony. Choose something different for your wedding recession. There are a lot of exciting options. For instance, your guests can throw paper airplanes, eco-friendly confetti, ringing bells, or waving ribbon wands. Your guests can even wave flags when you exit. Choose something different than the traditional garter or bouquet toss. For example, you can give individual flowers to your loved ones and friends. Or else, you can have a boutonniere or bouquet station, where the guests can create their own flowers. You can also organize a unique anniversary dance for all the married duos at your marriage ceremony. Add your own language to the traditional wedding vows in order to make your wedding ceremony more meaningful to both of you. If you do not like the idea of writing your vows from scratch, you can change the conventional wordings or else you can consult your officiant for something not that traditional. Leave the flowers alone and ask your bridesmaids to carry a clutch purse, which could carry tissues for some touching moment. The bridesmaids can even carry lanterns, which will provide additional lighting at night. Books are also an excellent option for a wedding with a bookish theme. 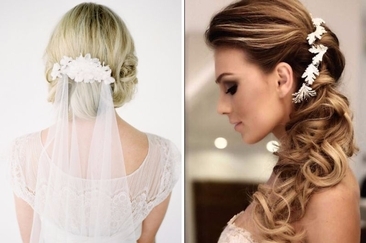 Skip the standard headpiece, the long white veil, and wear something different such as a soft feathery fascinator, a flower crown, some sparkly hair clips, or a chic headband. Or, do not wear anything at all, just let your hair down. Break away from the traditional white wedding dress, wear a dress in black, blush, champagne, or pastel hues such as lavender, mint, cornflower blue, etc. This will lend an understated charm to your ensemble as well as your nontraditional wedding ceremony. You can also wear an ivory or white dress and add some hint of color by wearing a cardigan, sash, piece of jewelry, or pair of shoes. How long does a wedding ceremony take? 15 minutes? 45 Minutes? 2 Hours? It will vary according to what kind of ceremony you are planning to take. Many adds can add to your ceremony length. 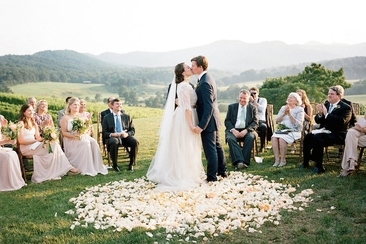 So many wedding ceremony traditions can be skipped! 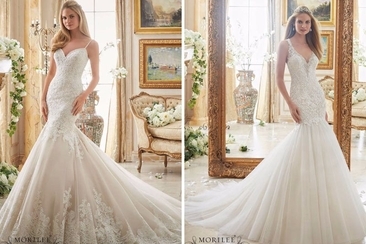 Without them, you can make your wedding day totally yours! Don't hesitate and just remember to be creative. 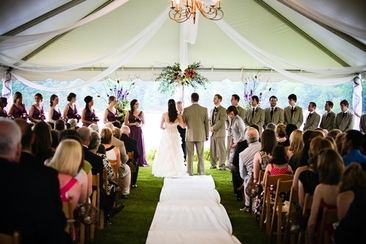 Organizing your wedding ceremony timeline at an early stage can help you make early preparations. Reading this article can get you all the help you would ever need.